I have such a strong memory of the first time I really ate bone marrow (on it’s own, not as sauce fortification). Craigie on Main, circa 2012. 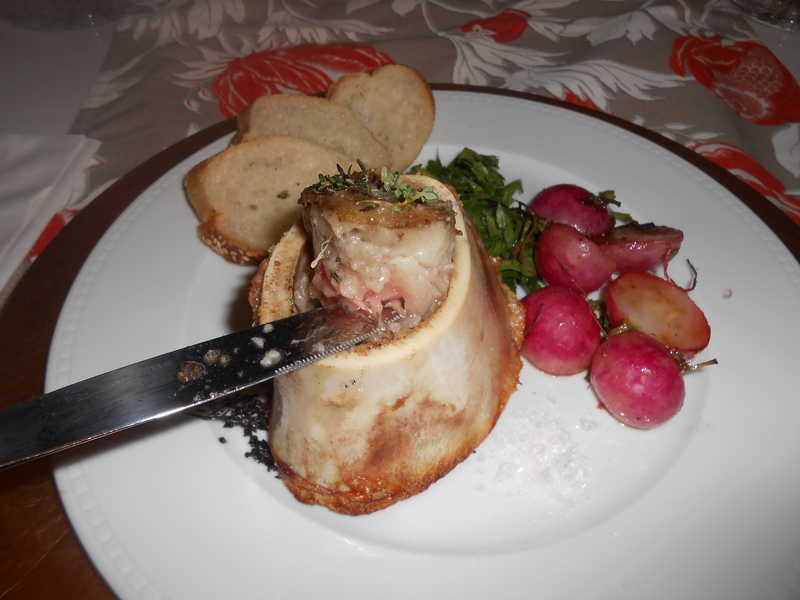 The bones were cut on the long side, so a narrow trough of glistening fatty marrow, browned and salted was exposed. It was served with crunchy baguette- and intended to be eaten smeared on the bread. Like butter. It tastes like vaguely beefy butter- smooth, rich, slightly sweet- and when seasoned with crunchy salt, and perhaps lifted with a little acid- it really sings. Since then, I have sought it out and ordered it wherever and whenever possible. It is usually treated quite simply- why ruin a good thing? 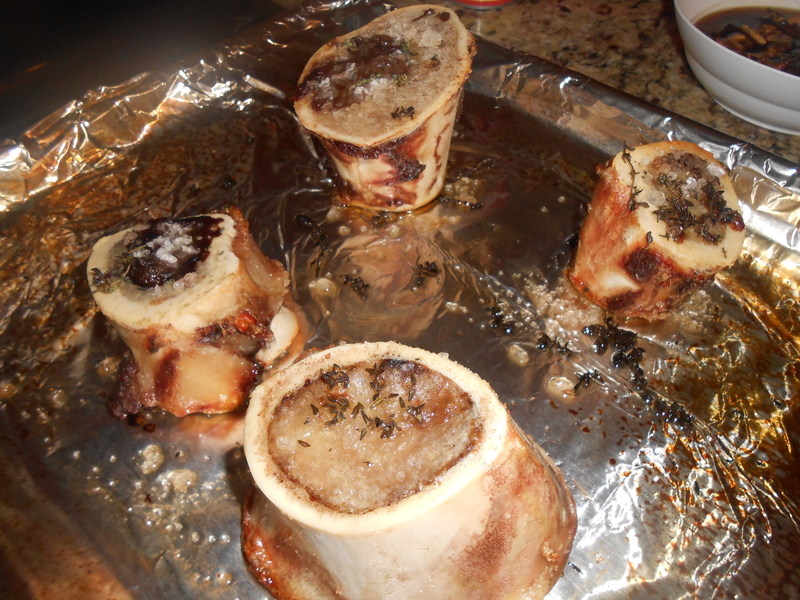 So last weekend when Mike and I were thinking on things we hadn’t done before (at home) and wanted to try- roasting our own marrow bones was top of the list. Quick research revealed that this was not going to be difficult. Some people soak the bones in salt water prior- we did not, but how could it hurt? The consensus was to roast at a high temperature (425 or so) for about 20 minutes. Liberally season the cut sides and just toss ’em in the oven and serve with bread. It occurred to me that radishes would pair nicely; radishes go well with salted butter- and what’s so different about marrow? 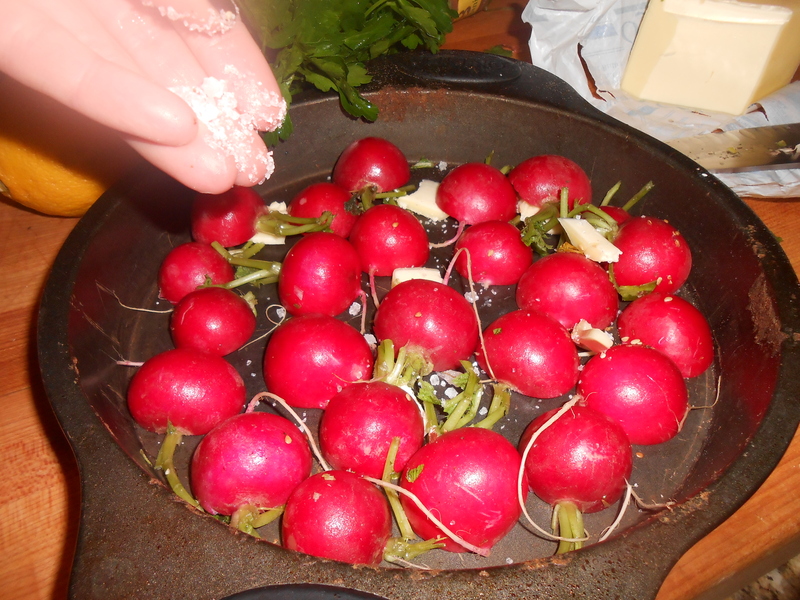 Mike suggested roasting the radishes to bring out some sweetness and cut their edge a bit- so we did. We cut the radishes in half (so they would have a nice flat surface to spread marrow on) and roasted them in a bit of grass-fed butter. Preheat the oven to 425. 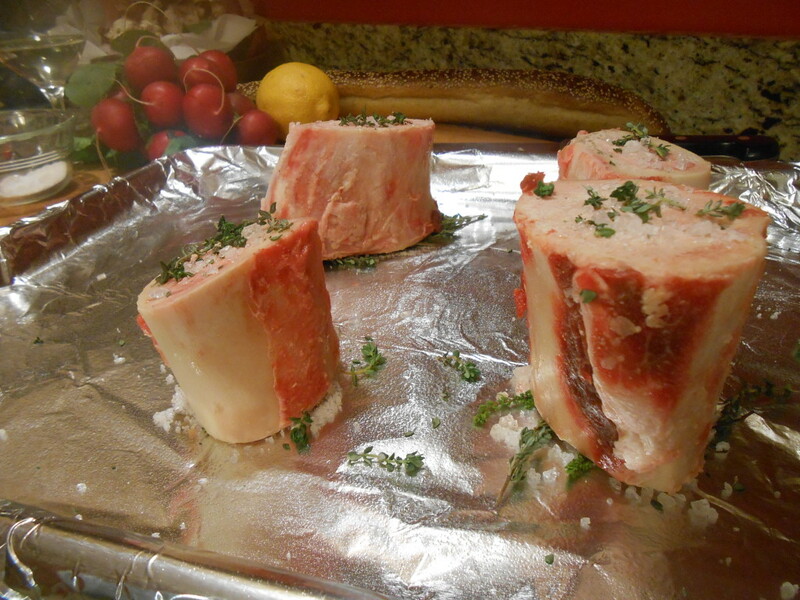 Line a baking sheet in aluminum foil; under each beef bone sprinkle a little salt and 1 sprig of thyme. Place a bone, cut side down (there will be 2 cut sides, so I placed the thicker end facing down) on the sprinkled salt pile. 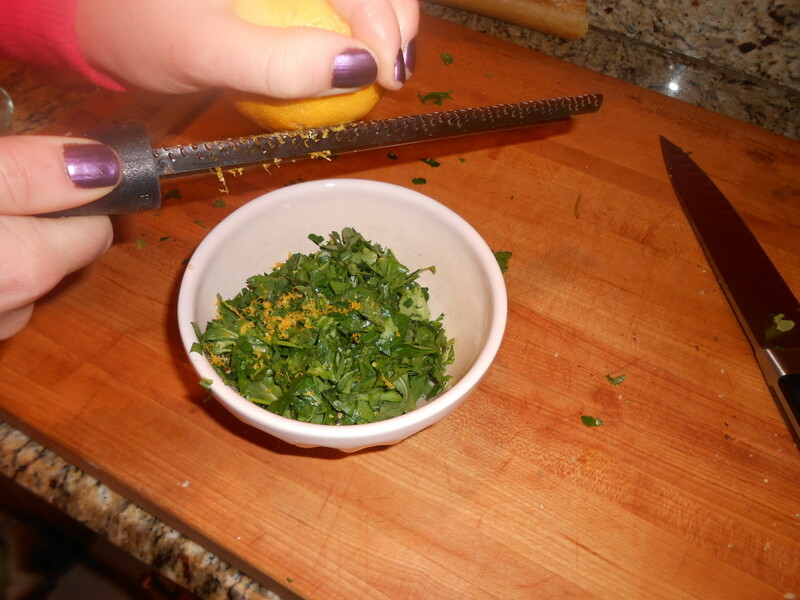 Season the top cut side with crunchy salt and crush some thyme leaves on top, as well. 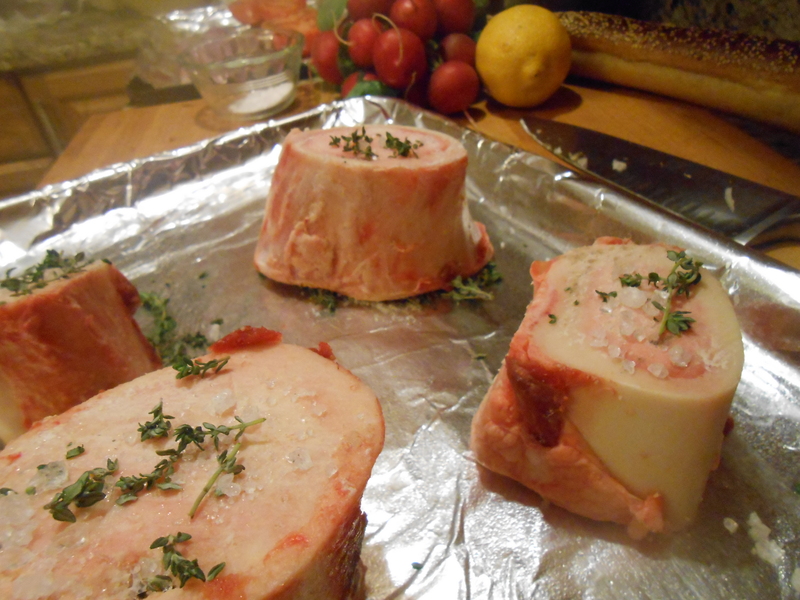 Place the beef bones in the oven and roast for 20 minutes. 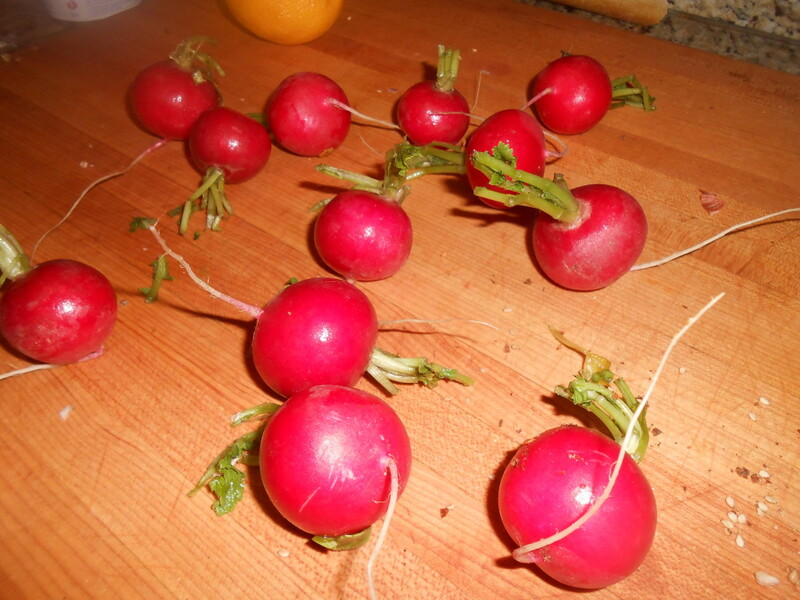 Arrange radishes cut side down on a baking sheet. Dot with butter (it will melt over them as they roast), or drizzle with olive oil. Season with a pinch of salt and a heavier pinch of pepper. 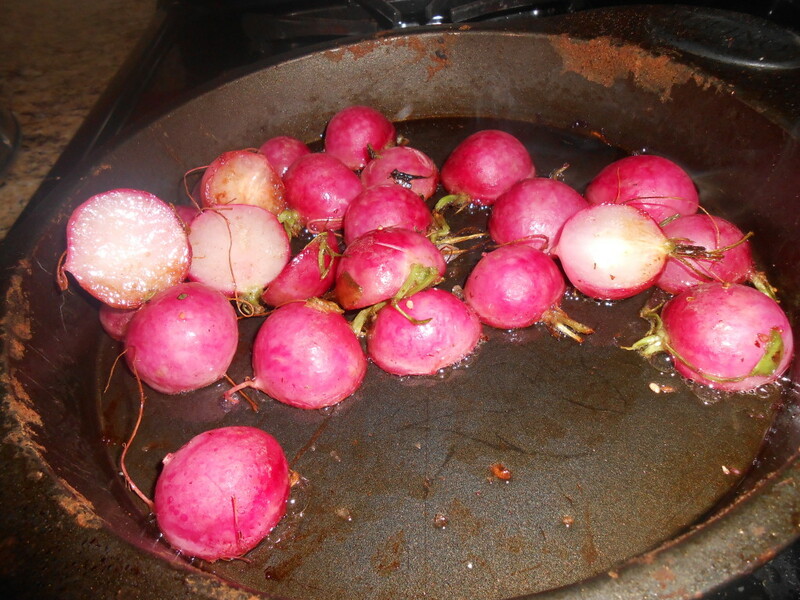 Roast for about 15 minutes; then stir/flip the radishes. Roast another 5 minutes or so. (Same oven and temperature as the beef). 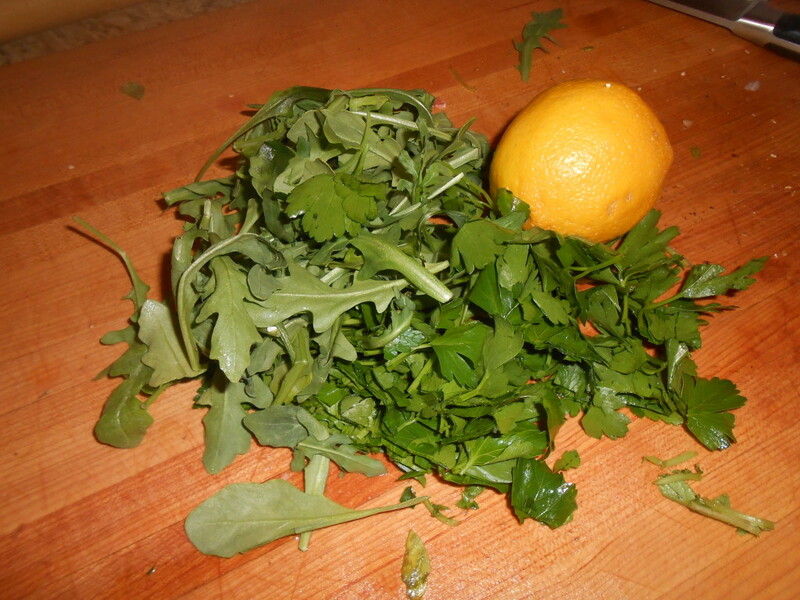 Prepare the gremolata: chop the parsley and arugula together until it resembles "salsa" texture; add the zest and juice of the lemon. Season with pepper. When the beef is done, allow to rest for 5 minutes or so. 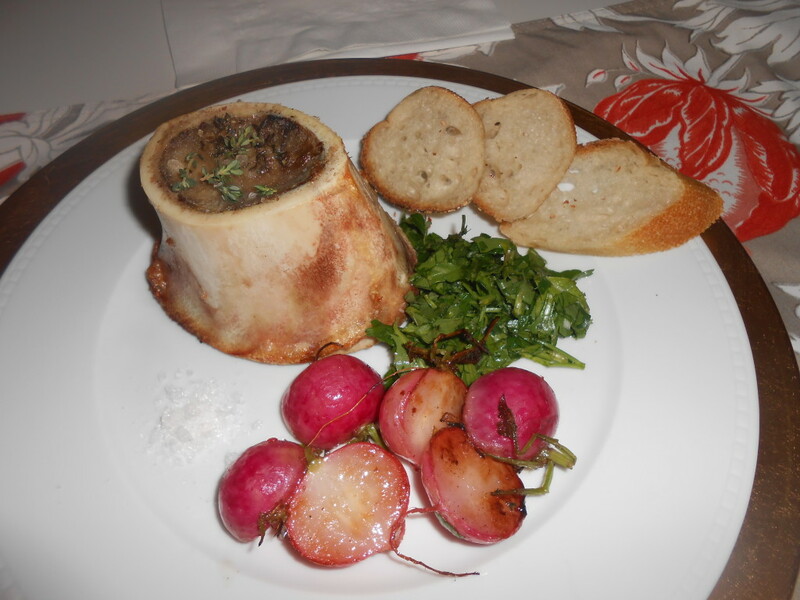 To serve: arrange 1 marrow bone, a small pile of radishes, and a bit of gremolata on each plate. Serve crusty bread alongside. Include a spoon and a knife for scooping the marrow out of the bone. NOTE: Beef bones can be purchased easily at your butcher (they will usually cut them to order). I have also seen them in the freezers near the meat counter at Whole Foods. A HUGE PLUS: This is a super cheap appetizer!!! Beef bones are seriously inexpensive. Buy a ton of them so that you can make your own beef stock or enrich any sauce with all of the collagen that the marrow contains. (it thickens and glossifies sauces!). HUGE PLUS, PLUS: Marrow, while fatty, is a nutrient dense food. It contains massive amounts of vitamins and minerals and because of the collagen content is great for your joints, skin, and hair. SO GO FOR IT!. 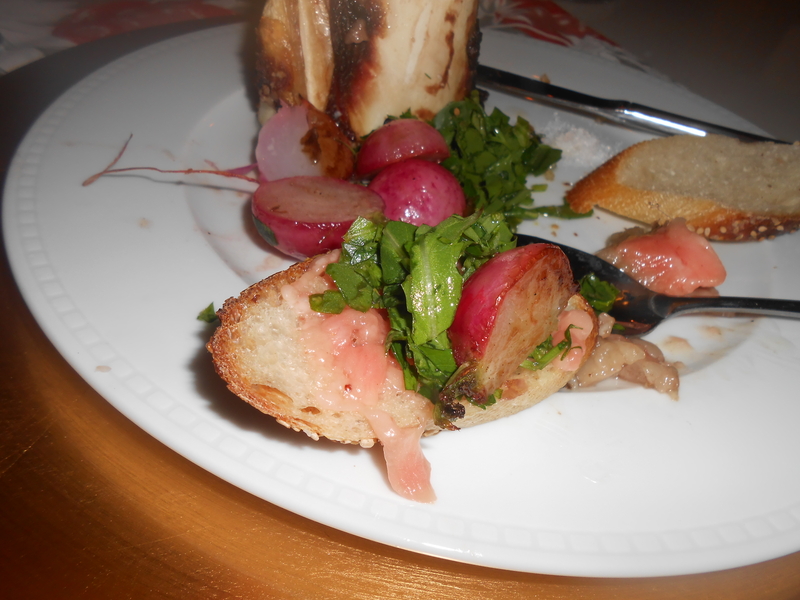 Suggested way to eat- spread some marrow, gremolata and radish on the baguette and eat as a crostini! Salty, sweet, rich, crunchy. MMMMMM. 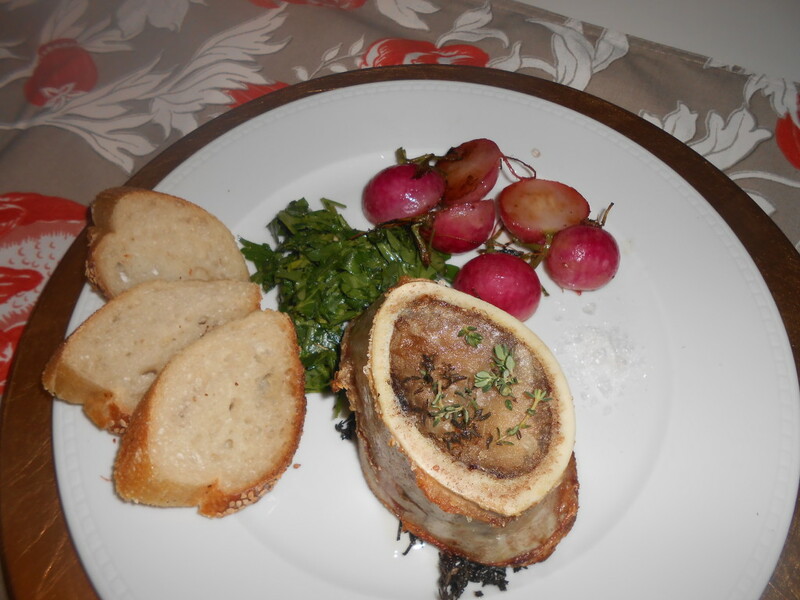 This entry was posted in Cooking, Recipes, Uncategorized and tagged beef marrow bones, bone marrow, gourmet beef bones, gremolata, roasted beef bones, roasted radishes. Bookmark the permalink. Wow, I have never heard of eating bone marrow before! Just so I understand, you scoop out the middle part and put it on bread? You don’t eat the outside part? I really want to make this–I have the feeling it will make people talk, in a good way!–but I want to do it right.